Jackie Christos and W.Bro. Stuart Warrington with Wii games expert, Charge Nurse, Shirley Bell. Toward the end of W.Bro. Stuart Warrington’s tenure as Master of the Lodge he virtually single-handedly organised the equipment for, and decoration of, a custom-built package for the Adolescent Room in the Dunedin Children’s Hospital. Utilizing funding from Lodge St. Patrick, Stuart had much of the room’s bespoke equipment manufactured locally, to order, and supervised its construction. He also took Children’s Play Specialist, Jackie Christos on a shopping spree, whereupon they bought chairs, a Nintendo Wii video game console, a Wii controller and cool retro wall prints, among a series of items. 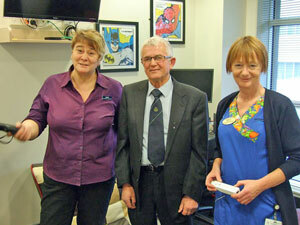 Stuart is pictured with Jackie Christos (left) and Shirley Bell, Charge Nurse Manager of the Children’s Ward. Shirley was seen trying her hand with the Wii games machine – but says that she possibly needs more practise.